As I’ve posted here before, I am a distributor of a product that I love called the BioMat. 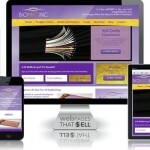 I am excited to announce a new website: www.BioMatInc.com. It is always a fun, creative process to write, develop and design new websites. This one was no exception! We are envisioning it to be a beautiful portal sharing information about this amazing product and facilitating ordering for thousands of customers. Check it out and let us know what you think!